Paddy Barnes recently joined NSPCC and the Ardglass Vikings to launch their annual Viking Boat Races at Cutters Wharf in Belfast. Now in its fourteenth year, the races will see keen Vikings competing for victory, as well as onlookers being able to enjoy impressive falconry displays and amazingly accurate Viking re-enactments, all in aid of NSPCC Northern Ireland. 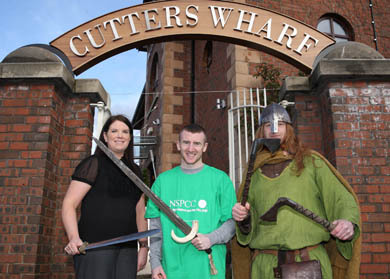 Paddy Barnes, centre, two times Gold olympic boxing medalist with Fionnuals Savage, NSPCC, and an Ardglass Viking ready for the 4 May at Cutter’s Wharf. Sponsored by Alska, The Swedish Cider Company, the May bank holiday weekend festivities will include the famous Viking boat race on Sunday 4 May. 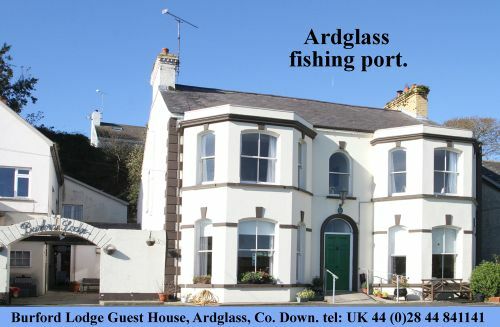 For the first time, there will also be an additional Pro Viking Race Day on the Saturday 3 May, with professional rowing teams from all over Ireland and further afield including Isle of Man competing against each other. The main Viking Boat Race will begin at noon on Sunday 4 May and will see hundreds of would-be Vikings given the opportunity to race the actual long ships featured in the RTE hit series Vikings. Onlookers can enjoy impressive falconry displays and amazingly accurate Viking re-enactments; all accompanied by hearty barbeque fayre and fabulous entertainment. Male, female or mixed teams of ten are welcome to apply! Members must be aged 18 or over and teams are asked to raise an entry fee of £200 per team through sponsorship. Keen Vikings are encouraged to go the extra mile and raise £400 or over to receive free t-shirts, delicious barbecue items and accompanying Alska Cider as a reward for their efforts. Fancy dress and raffles prizes as well as presentation of the Cup make it a great day out for those wanting to support a good cause! Fionnuala Savage, NSPCC Northern Ireland community fundraising manager, said: “The annual Viking boat races are the perfect opportunity to test your strength, speed and endurance. It’s also a chance to dress up and have a great bank holiday, all while making a difference for vulnerable children and young people in Northern Ireland. You can also show your support for local children and families by texting NIChild to 70744 to make a donation of £4.